The threat to Aeros Island and Earth has come earlier than believed. Mackenzie was forced to join the Water Gods, crushing whatever hope the Fire Gods had in stopping the Erosion from claiming the remainder of Earth. As she discovers another side to her, as her powers emerge, she finds herself challenged beyond anything else to make the most difficult decision in her life, a decision that could change the fate of everyone. Kailin Gow does it again! 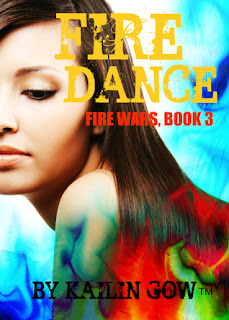 Fire Dance escalates the Fire Wars series into a faster-moving and heart-pounding ride. This third installment to the dystopian fantasy series brings more action, more knowledge about the god and goddess embodiments, and more tough decisions. Before, with every step of progress Mac made to learn more about her past life as Vesta it seemed that she'd take two steps back, fighting for her life. As the war against Abzu rages, Mac must choose which powers to finally embrace, Fire or Water, or risk losing the battle altogether. Kailin gives readers what they've been looking for. Answers. Granted, not all questions are answered, but Vesta emerges in Mac and bigger pieces of their past are brought to the surface. Vesta's appearance really shakes up the plot and shows that the future of the series can go in any direction. The biggest change comes in Mac. She may have the goddess' powers and memories, but she becomes a leader all on her own. When she's backed against a corner, she doesn't despair or plan a pity party. Instead, she takes charge and inspires others to join in the fight against evil. Fire Dance almost seems like the beginning to a whole new journey. Mac will still have to protect the world from the wayward water embodiments and her love for both Varun and Chance remains strong, but the ending plot twist completely changes the game. The surprises in store will not disappoint Fire Wars fans, but make them eager for the next installment! To enter: Please read the Terms & Conditions located on the Rafflecopter form.